I don't know whether it would be due to repackaging old stock - but I think it's more likely that new discs have been pressed for this edition. I imagine it's also out of a desire to have the sets carrying the StudioCanal name rather than the Kinowelt one. You're right, Alan, these are new discs - checked. In this case, I take back my words. I presume the old discs would carry the Kinowelt logo on the disc label, so I imagine this is an easy way of checking whether the discs are new or not. If they are, the won't have Kinowelt logos printed on them. Ha, this is the thing I did not think of. While I saw difference in logos on the boxes, I automatically thought that the disks are identical (I was must to check, but strangely enough I did not have this idea at all - I'm losing my grip ). Only after your words, Alan, I realized that I had ridiculously missed the obvious thing. I'm good at obvious. You're better at anything else, my friend. The Gale pisodes are great fun to watch. They're like live theater , a unique experience. The filmed episodes are like movies, so there's a huge difference between the two. The Gale episodes are great fun to watch. They're like live theater , a unique experience. The filmed episodes are like movies, so there's a huge difference between the two. I love the Cathy Gale era. In fact, the 3rd and 4th seasons are neck and neck for my favorite of the series. The 2nd season is a bit uneven in my opinion, but I still like it a lot, and many episodes are better than the 3rd season. I would love to see more of the 1st season as well. Some people are just used to old 405-line videotape productions because they grew up watching it. I agree Michael. I just love Seasons 2 and 3. It's television like we'll never see again. Finally, found the new box for the Cathy Gale years, edition 2. Recently I ordered the b/w episodes with Emma Peel on DVD at Amazon, I wonder if I get an old edition (Kinowelt) or a new one (StudioCanal). In any case, I have neither one nor the other. Just posted the scans of menu and the ad flyer in the German DVD-edition of the episode "Tunnel of Fear" on Steedumbrella. 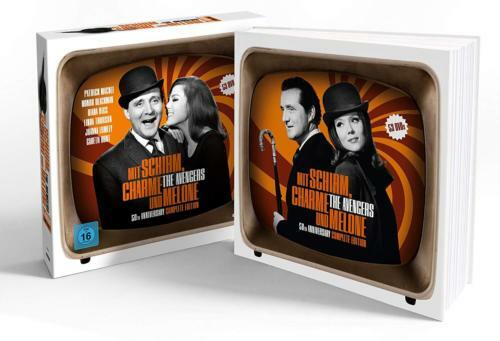 Just finished studying and posting on Steedumbrella for the German DVD edition of the b/w Emma Peel episodes, released in 2017 by StudioCanal. On Steedumbrella page for this DVD edition I presented the original scans of the cover of the box with disks (not the total package) and each DVD disc. Just click on the images to see the originals. Also presented a booklet in the PDF format by clicking on "Сканы буклета". 1. Each DVD disc starts from the Warning in German, followed by the "Kinowelt" video insert (which is a mistake, as from September 1st 2011, Kinowelt was "absorbed" by StudioCanal). Looks like the contents of the disks before the DVD menu has not been changed and taken from the old German DVD releases. (I can not confirm because I do not have other German DVD editions of this season). 2. After Kinowelt video logo, there appears the menu (see the screenshot below), asking whether you want to turn on or turn off the intros of Oliver Kalkofe and Wolfgang Bahro to each episode. You will be able to adjust this in the general DVD menu too. On the first DVD disc, if you will turn on for Oliver Kalkofe and Wolfgang Bahro in root menu (see the screenshot above), you will see the Greeting these two men before you enter the main DVD menu. This is only on first DVD disc. Although the main DVD menu design is identical to the old German DVD editions, there are small changes. For example, DVD menu of episodes. Yes, these changes are that now every optinal item has an arrow. Menu of bonuses on first DVD disc are bit of different too. 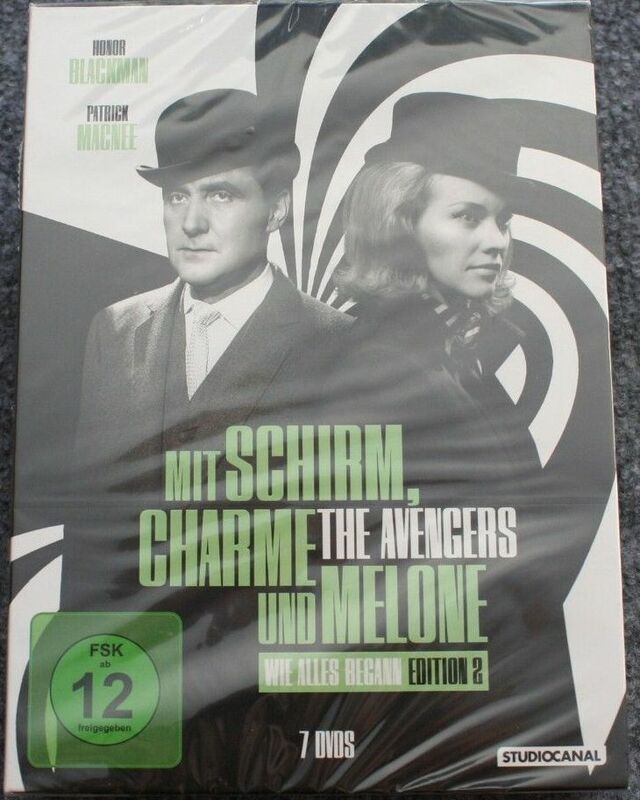 It is very possible that other German DVD editions of b/w Emma Peel episodes including videos from Oliver and Wolfgang have same DVD menus (that is, like 2017 German DVD edition). Prints of the episodes are identical to those (including the "StudioCanal" video logo that precedes each episode) that were first released by Optimum / StudioCanal in 2010. The only exception is the episode "Too Many Christmas Trees," where the name of the director and scriptwriter is correct, and the episode "Man-Eater of Surrey Green" where the musical accompaniment in the footage "Lennox emerges from behind the trees on the road to the truck and watches the unloading of bags of fertilizer"is presented as in other copies of the episode. 1. Episodes The Thirteenth Hole, Quick-Quick Slow Death and The Danger Makers are Cut!!! Like Optimum prints, again. 2. The screen resolution in some scenes of the episodes The Cybernauts and The Thirteenth Hole is even larger than in USA prints that have already been slightly enlarged screen resolution. 3. There is a fading between the scenes in the some episodes that were just as change the frames in the USA and many other old prints. Well, I have to say, ladies and gentlemen, do not get rid from old Avengers prints with b/w Emma Peel released until 2010 if you have these and you appreciate the content of the material. ... which I bought together with the Teil 2 (with logo StudioCanal). Again, when checking the content there was one amazing surprise. ...- however, when you start watching episodes, you see the prints that were first released by Optimum / StudioCanal in 2010! This is the first time I encounter such a situation. So, it is really the new German DVD edition (2015), despite the fact that nothing except the episode prints else has been changed. I scanned the booklet from this edition and posted on Steedumbrella. I decided not to study these Avengers prints in detail since I will analyze the Optimum prints when I will do the work with the Tara King episodes for posting on Steedumbrella. 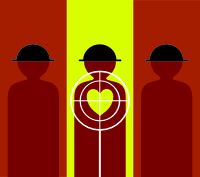 ... where box is new unlike Teil 1 (see post above). Again, each DVD disc starts with a warning in German, followed by Kinowelt video logo (which is a mistake, as the company was absorbed by Studio Canal in 2011). After, appears the menu. And again, the prints of the episodes are identical to those (including the "Studio Canal" video logo, which precedes each episode) that were first released by Optimum / Studio Canal in 2010. On the page in addition to information, scans and screenshots of the DVD edition you will also find the original scans of the cover of the box with discs and DVD discs when you will click on the corresponding images. I happened to see this little beauty in a shop today, not in Germany but in the Netherlands. Didn't buy it of course, but despite the unpractical book style instead of having the discs in boxes, it would be a sweet thing to have on the shelf. The packaging outside of the UK always seems to be nicer - even the menus are more aesthetically pleasing to me.